s Up until now, I’ve posted two covers by Mystery Jets. But, then I thought, wait a minute, let’s take a step back and take a first look into the recent works of these twenty somethings, Eel Pie Islanders' own. The fact that everyone knows this band, and that I'm just about to write a post on them just shows how much I’m constantly at the cutting edge of new music-- the truth is, not at all. As you all know, the band have just recently released their sophomore record entitled Twenty One last March, which feels like ages by the way. 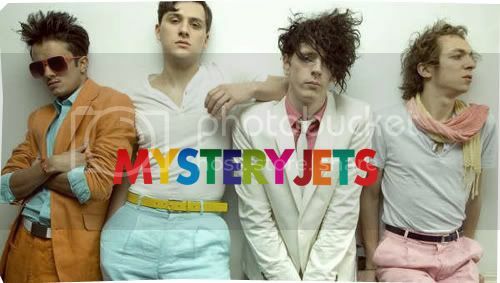 I can’t quite put my finger on it, but trying to pigeon hole the songs of Mystery Jets can be quite a challenge. But the songs definitely has an overall leaning towards the pop side of music, though judging from the band’s image, the type of pop tunes this foursome conveys are anything but your typical and average kind. First of, you have songs like ‘Young Love’ which bears high resemblance to the main theme of Hugh Grant starred, rom-com chick-flick, Music & Lyrics. Is this pure coincidence? Or better yet, is this another cover? But apart from the uncanny resemblance, the song features the talented young crooner, Laura Marling, which pretty much compensates for everything that the song lacks. Then there’s ‘Two Doors Down’ which hearkens back to cheesy 80s moments, boasting a set of flaring synth lines, and ‘Umbrellahead’ which is just well, ‘Umbrellahead’.